In discussions about new media, you will often hear the division of media opportunities as Paid, Owned, and Earned media (P.O.E.M.). Over the years, I’ve studied the various categorization of media from a few perspectives, 1) that of traditional content creation, owners, budgets, and metrics, 2) how social networks cater to consumption and sharing, 3) how progressive businesses are approaching content strategies in social media and how they’re rethinking departments, intentions, metrics, and budgets, and 4) also how media opportunities are packaged and sold by each network and who’s buying them and why. In many cases, I’ve found that media is not limited to three groups, but instead categorized into five key segments: Paid, Promoted, Owned, Shared, and Earned. 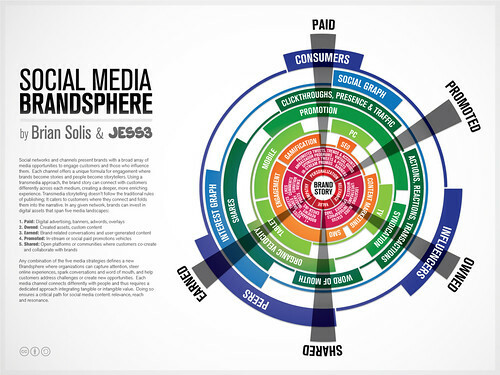 To visualize the model that reflects the state of new media, I once again partnered with my good friends at JESS3. The result…The Brandsphere. Any combination of the five media strategies defines a new Brandsphere where organizations can capture attention, steer online experiences, spark conversations and word of mouth can help customers address challenges or create new opportunities. Each media channel connects differently with people and thus requires a dedicated approach integrating tangible and intangible value. Doing so ensures a critical path for social media content: relevance, reach and resonance. Center (White): At the center of the Brandsphere is the brand story. Everything starts with not just defining what the brand represents, but how it comes alive in social networks. This requires definition through a social media style guide and the development of a complete persona, voice, and promise. Ring 1 (Red): The brand story is supported by tenets that serve as the connective tissue between the brand story and the technology that creates a path to consumers. Ring 2: The vertical gray lines (triangles) divide the media types between Paid, Promoted, Owned, Shared, and Earned. Ring 2 provides the various options available to brands within each channel. Ring 3 (Orange): Each media type is then enlivened through various forms of activation including Engagement, Gamification, SEO, Content Marketing, and SMO. Ring 4 (Light Green): Media types are then visualized through the various platforms consumers use to discover, consume, and share content aka the Four Screens: PC, TV, Tablet, Mobile. Ring 5 (Green): Media objects are then pushed and socialized through promotion, syndication, and organic means. Ring 6 (Dark Green): Objects are further distributed and also measured through 1) Clickthroughs, presence and traffic, 2) Actions, Reactions, and Transactions (A.R.T), 3) Word of Mouth, and 4) Shares. Ring 7 (Light Blue): Content then finds a permanent home among the groups that value information based on social graphs (personal and professional relationships) and interest graphs (networks based on commonalities and shared interests). Ring 8 (Dark Blue): Objects are analyzed, activated, and/or repurposed by the various markets intrigued by the branded story. The results of new media programs are measured by resonance, reach, and outcomes. Those that garner traction travel from the center outward and again from the outward in and back out again. The Brandsphere is the visualization of Social Media’s critical path, R.R.S. Thus content programs require a thoughtful approach where media tells connects information, narrative, and people through their channels of influence in ways that spark interaction and circulation. Please go to theconversationprism.com to download a free hi-res version for printing or for use in presentations. This is fantastic. Thanks for sharing this Brian! It’s steps like this that will make convergence happen! Keep up the good work. You guys have done it again!! Great post and infographic. always good to use visuals to explain complex matter. Helpful model for using SocialMedia in a branding strategy. Brian: You and JESS3 have again added a valuable visual aid to help in the formation of a “theory” of social media relationship building. Thanks for sharing. Great visual aid. Makes it easier for people to understand how social media works with marketing. That’s quite an in-depth and informative infographic Brian, really well explained in this article too, nice work! Always a fan of your infographics, this one is too confusing. It seems targeted more at companies and traditional branding and less at individuals and personal branding, yes? Or am I missing something, Brian? Hello Ari, indeed. This one tackles the behemoth landscape of corporate media. Maybe so , but there is much that can be gleaned from it even at the individual level (or small scale business). I think that graph helps simplify what would otherwise be a very long and certainly confusing topic without it. Love the work you’re doing. Can’t wait to sit and chat. Hi Brian. As a student hoping to do a dissertation around the area of integrated marketing communications I found this contemporary illustration very insightful. thanks for posting. Although I’m normally a fan of your work… I just don’t get this infographic. Are you suggestion that influencers are not consumers or (perceived as) peers and that they are to be reached with owned media -or that they are a part of owned media? If by influencers you are talking about those with a big readership which owned media are you referring to? Why is there such a gap between earned and paid and does the rest have a set amount of difference? Like I said – normally love your work… I just don’t seem to understand this one. Could you go a bit more in depth how you’d use it in another post?